This past year was a good one for the software-as-service (SaaS) industry in Canada, with more deals being made than the previous year and total investment in Canadian SaaS reaching $1.62 billion according to L-Spark. The Ottawa-based accelerator, focused on helping SaaS companies, released a report Wednesday on the ‘State of SaaS 2018’, rounding up all the disclosed investment deals made to Canadian SaaS companies over the past year. It found that a significantly higher amount of deals were made in 2018 than the previous year, with 229 total investment deals compared to just 100 last year. PointClickCare, the Mississauga-based, healthcare software developer came out on top with $186 million in total investment this year. Only seven companies received more than $50 million in total investment. 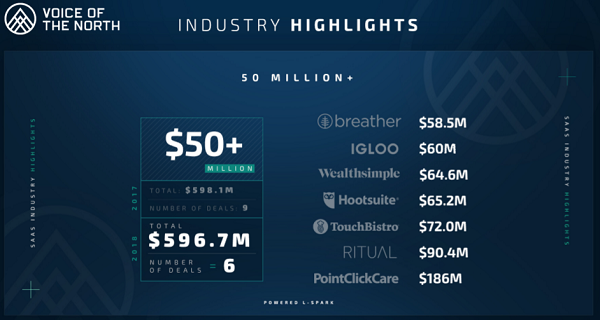 PointClickCare was followed by Ritual with $90.4 million, ToucBistro $72 million, with Hootsuite, Wealthsimple, Igloo and Breather all receiving around $60 million in investments respectively. 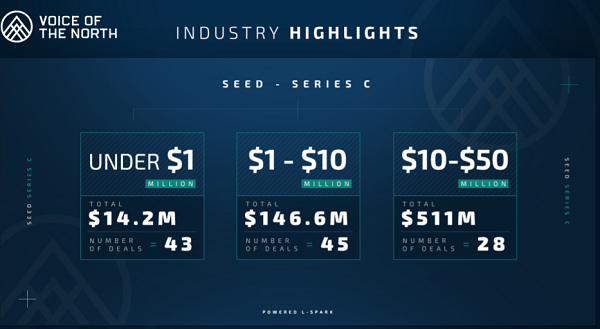 In comparison, the average deal size was $10.3 million, with the majority of companies receiving somewhere between $1-10 million in total investments from Seed to Series C funding rounds. L-Spark also named Montreal-based Lightspeed as “one to watch” in 2019. Lightspeed is a point-of-sale (POS) and e-commerce software provider for small and medium businesses (SMBs). According to The Globe and Mail, it is currently preparing for an initial public offering (IPO) on the Toronto Stock Exchange sometime next spring. The most invested in SaaS industries are marketing and sales, mobile apps, fintech, cloud computing and e-commerce. Many of these industries saw an increase in deals from 2017, but none more than mobile app SaaS which saw a significant increase from five deals last year to 32 total investment deals in 2018. Marketing and sales software investments totalled 46 this year, up from 16 last year. Fintech also seems to have been a hot topic making up 20 of the SaaS investments. The $1.62 billion in funding came from more than 174 investors, mainly from Canada and the U.S., with notable investment also coming from Australia, France, Greece, Germany, Netherlands, and Singapore. Ontario-based SaaS providers received the most funding, with $868.8 million invested in 96 different deals, followed by British Columbia with $234.9 million for 46 deals and Quebec companies seeing $132.6 million for 47 deals. L-Spark itself, which is co-hosting its first ever SaaS North conference in Ottawa this week, boasts having accelerated 47 companies to date, having raised $30.1 million in funding. SaaS and the public cloud software market is set to grow even more in the coming years with an IDC Software Tracker report forecasting that Canada’s public cloud software market will reach $4.1 billion in 2019.